October is easily my favorite month of the year. (And it’s not even my birthday month!) I love everything fall stands for… Football, pumpkin-spice and apple-cider-flavored anything, stunning foliage, leaves crunching beneath your booties, cashmere scarves, cozy sweaters, plaid, chambray, and maybe my most favorite of all — piling on the layers. Sometimes I think about how I really need a “fall body” instead of the typically summer body. I like to pile on the longer shirts and blouses, sweaters, vests, blazers, and jackets. So much so that I look like a Michelin man from time to time. I was actually on a date last week and he asked me, “Wait, how many jackets do you have on right now? !” Hahaha, I can’t even make this up. Man-repelling at it’s finest, I must say. I’m always in search of new ways to layer without adding too much bulk. (Vests are a god send! Sometimes there are only so many layers you can fit in a jacket sleeve, you know?) Draping a sweater over my shoulders has been a go-to lately. And over the last few weeks, I’ve been into the whole tying-a-shirt-around-your-waist thing. Takes you back to middle school, huh? I remember tying sweatshirts around my waist when I’d get too hot in gym class. What goes around comes around, I suppose. 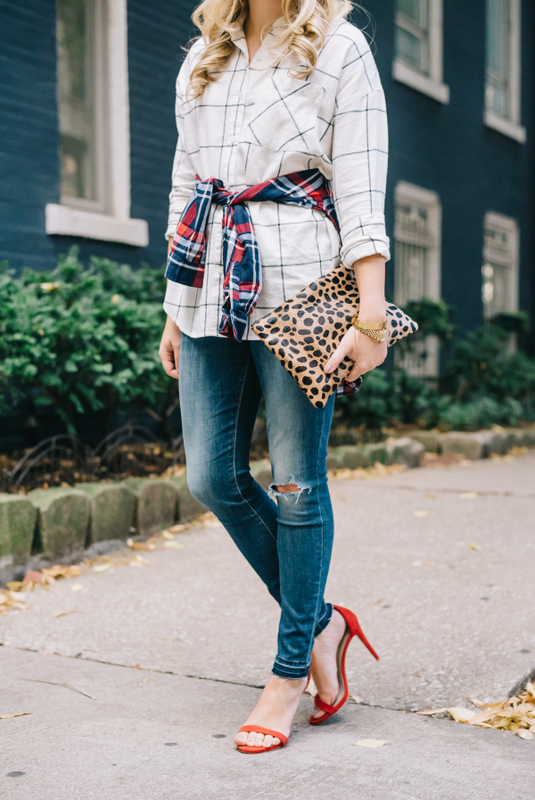 I like how the extra shirt adds another pop of print (gotta love plaid on plaid!) and defines the waist a little bit, too. It adds interest without adding any bulk at all! 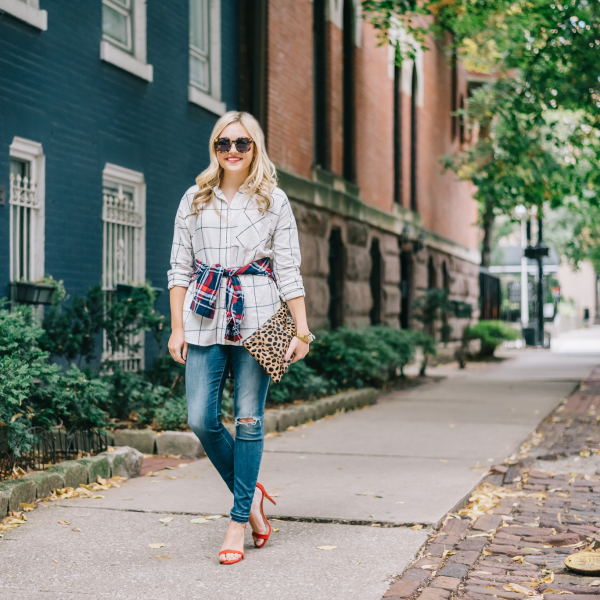 This outfit is perfect for a fall brunch with the girls and if you swap the heels for a pair of sneakers or your go-to booties, you’ve got yourself a great game-day outfit. 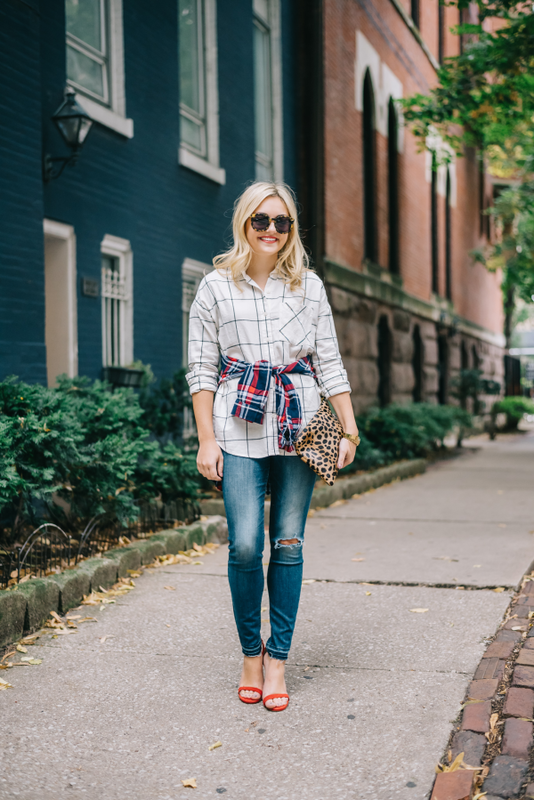 Plaid has always been one of my favorite fall prints. A little bit borrowed-from-the-boys and a little bit lumberjack makes for the perfect print to pair with your most feminine pieces. Juxtaposition at it’s finest! Plaid can festively take you on just about any autumn adventure you have planned… Apple picking, a trip to the mountains, the pumpkin patch, or even a football game. Where are you wearing your plaid this fall? 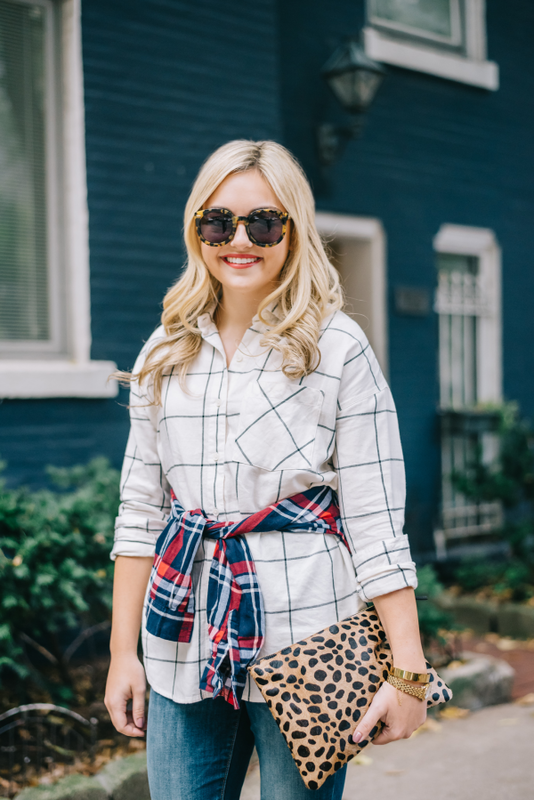 Love the windowpane shirt – been trying to find one in that print! 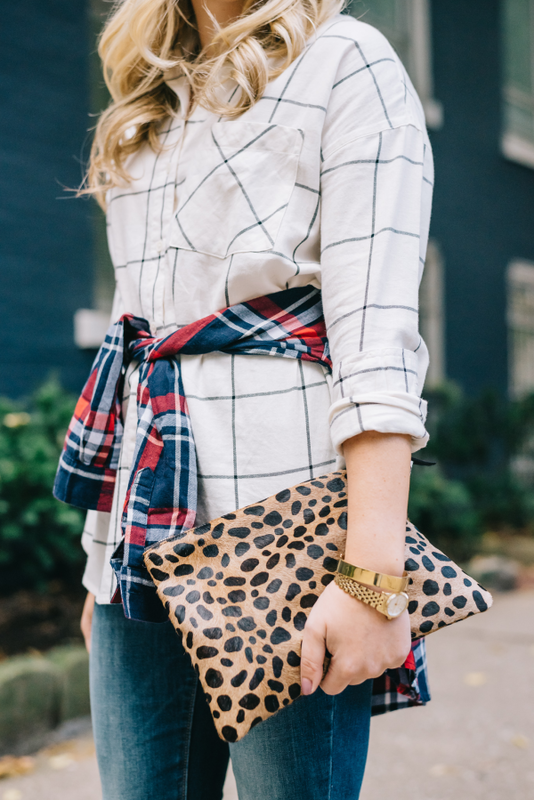 Love the look of plaid on plaid, its such a fun way to mix it up during the fall! Super cool and unique way on how to wear two plaid shirts at once! I love your print mixing and layers! So on point for this time of year. Super cute look! I love plaid at fall time! Loving the plaid on plaid!! I have to agree with you that everything about October is beyond amazing! Your red, white, and blue flannel is super cute! Haha! I’m someone who likes to layer a lot too. I’m sure people have wondered how many jackets I was wearing. Love this look, by the way. 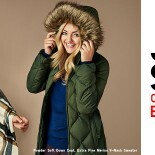 I live in Texas so layering is looked down upon right now since we’re still experiencing 90 degree weather. But I feel like a shirt tied around the waist is the perfect touch without being too much or overwhelming. Just absolutely love! Congrats on your new collection! How come I’m reading about it on other blogs but not your own?! Love this outfit! I love all the mixed patterns. I love how you mixed prints here! I would have never thought to put that kind of stripes with plaid.